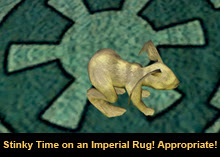 Read more on the official SWG forums about the five steps needed to help SWG realize its true potential. Favorite Drink: Daranu, but you just can't find a good glass any more. Favorite Species: Twi'leks. But can I specify a gender, too? Favorite Planet: Zeltros, the Pleasure Planet. I heard it was... nice? My utopia crashed and burned. Scruffy, despite his inexplicable desire to assault anyone who even thinks about dancing, both he and my dear Amber are both a delight to care for. Scruffy spends his afternoons hopping about the base, sniffing and exploring, while Amber has been working hard on learning her tricks and tactics. Then there is my kimogila, Kiba. He's but a baby still, I'll grant. But should there not be some level of decorum maintained? As you'll recall, I am an experienced handler of creatures, having raised and trained several fine companions that even saw military action for the Alliance. But Kiba is a beast all to himself. Where shall I start? Perhaps his refusal to eat almost anything I place before him. Or is it his aversion to performing tricks. He'd rather storm about the base, causing mayhem and damage with his powerful tail. The other base residents were likely relieved when I announced he was on his way off the base in order to be trained and broken of his poor habits. Don't read me incorrectly, I love him dearly. He'll grow big and strong and will be an incredible asset for the Alliance. There are only a handful of domesticated kimogilas in all the galaxy. And please, no comments if you will... he IS in fact domesticated despite evidence to the contrary. And like I said. He's only a baby. I'm sure he'll be much easier to handle when he's four times the size he is now. 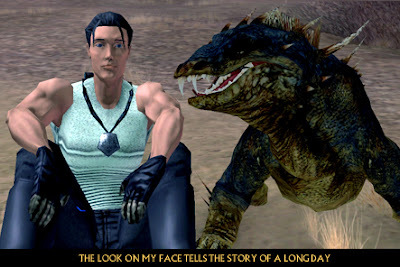 I just cannot get out of my head the fact that there is nothing in the heads of our PvE foes in SWG. It has become my belief that an engaging AI should be the top priority in the continued development of the game. No other modification or addition is as important. When a character makes level, wouldn't it be cool to select a level from any profession, provided certain prerequisites are met? This would allow players to mix and match professions, eliminating the "Us vs. Them" aspect of the game that divides the community. Thus a player could be a bounty hunter that dabbles in crafting weapons, or a tailor who is actually a spy! Wouldn't it be great if there were lowered tiered ships that a captain and crew could run around on and adventure together in? Why must space be, mostly, a solo experience? While it still can be, with the inclusion of just a few new ship schematics, players could choose to be a crew in space right out of the gates. It had been too long ago to even recall the time. I was on Naboo with a few frequent allies, doing who knows what. I had been practicing training a native creature there called a peko peko during some downtime. I had recently discovered a love for creatures. Not just admiring them, but training them, raising them. Scruffy was a good companion pet, but I had been looking for something that could hunt with me; protect me and the ones I love. It was then I spotted a lonely female plains tusk cat kitten taking cover beneath the shade of a tree. Her mother was no where to be found, perhaps having fell victim to a hunter or an even larger, hungrier predator. I let the peko peko wander off and turned hopeful eyes toward the tiny cat. Her eyes were already turned toward me in this first moment of a relationship that had nothing to do with owner and pet, but two friends that could not, and should not, be separated. I named her Amber for her eyes were that color. As I went, so too did Amber. She was the best friend anyone could hope for. And now, thanks to the bio-engineering of Cyra, the old girl has been given new life and new strength. An agreeable, eager huntress, Amber took quickly to her new strength and skills imparted upon her through an expensive and effective incubation process that literally reformed her at the lowest genetic level. You'll recall I refer to this as Mad Science. Amber and I set out on another adventure, allowing our whims to take us where they may. And where they took us was more amazing then anything we could have imagined. The planet was Talus, one of the planets in the Corellian system. We were following sludge panther trackings when we came upon a small town. "It's not on the chart", I said, not expecting Amber to understand as she lay curled in the passenger seat of my flash speeder. She inclined her head and then sat upright, sniffing the warm air. A click of a button and the terrain map click-hissed shut. I disengaged the speeder and reached behind the seat for my Coynite Disruptor. It was charged. "C'mon girl. Let's go. Something's not right." It wasn't the fact that it wasn't on the map as much as it was that it was dark and quiet. The sun was well into it's setting cycle and not a single light had come on in the town. Amber padded next to me, making not even the slightest sound. Such a good girl. The sludge panther tracks were still here, fresher then before. I knelt down to take a closer look; to see if another trail could be found. It happened suddenly. We were swarmed. Sludge panthers flanked us, surrounded us. Amber leapt to the defense while I broke open a toxic gas pack. The Coynite Disruptor spat it's golden blasts, knocking a panther back and to it's side. Amber locked jaws with another. I jammed a pet stim into her hind quarters, lighting her up with enough adrenaline to down her opponent. We were taken by suprise, but fought our way to safety and were fortunate to have all our parts with us. Scratch that. My holo-camera was crunched. "Cyra will never believe us now, Amber." She seemed to grin. "Now then, where did they come from. There's no cover here besides..."
The town itself. I snuck in for a closer look, giving Amber the hand gesture for her to stay back. Peeking around one of the larger buildings and staying downwind, I looked through to the center of the town. And my suspicions were confirmed. The town had been overrun by sludge panthers, some of them twice the size of any I had ever heard about. If there were three, there were thirty. I marvelled at how easily they were able to flank not only me, but Amber too. Where are the people that lived here? Did the panthers kill them? Not likely. Not all of them. We did not come all that way to come home without a proper tale to tell and something to show for it. I motioned for Amber to come closer and we watched and studied, and watched more. They were amazing creatures, natural hunters. "You're going to do that, Amber. I'm going to teach you how to flank like that. What do you say, girl?" I kept quiet and hidden as I studied. Amber gnawed on some meat snacks as her best friend kept watch through the night, making notes in a datapad. We made it as far as the starport when the night was through. Both Amber and I were exhausted from our ordeal. We curled together on an Arrival Area couch and drifted off. Amber had learned her new skills, and I had a mysterious city that I dreamt of. Will I ever know what happened there? I thought of the city and panthers as we fished the next day. Amber stayed with me the entire time, not complaining or fidgeting once. It's what makes her such a good friend. We can have the wildest adventures in mysterious cities as easily as we can have a lazy fishing trip. It is the company you keep, they say. Favorite Person Not Daddy: Mommy! I hadn't fished in quite some time, but a guildmate asked for some to decorate the cantina. It's still as addictive as before. It could use a little updating - perhaps some additional animations or sound? I needed to get my fishing system back, but once I remembered my old tactics, I was in the groove. Over the course of an hour, I had landed a good number of fish. If you've never fished before, what are you waiting for? For those of us who are former Creature Handlers, there is nothing quite like having an old pet returned to your side via the new Beast Mastery system. Those who know Vincer Kaden well will know of his stalwart companion, the female plains tusk cat Amber. It feels great to have her back again after so long. The Adventure begins again. 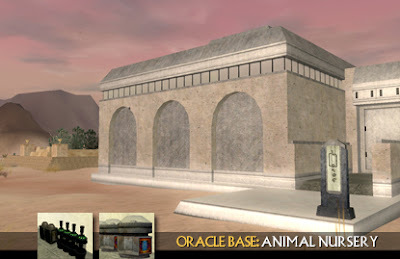 Oracle Base's Animal Nursery is located on the outskirts of the base, so as to keep it away from the hustle and bustle of the main structures. A small garden is just next door. 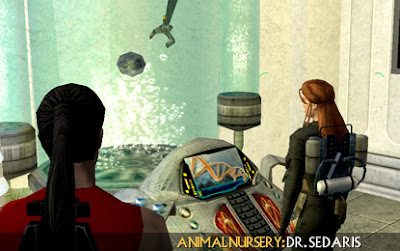 The inset pictures show some of the advanced equipment that Dr. Cyra Sedaris uses to reprocess creature enzymes for use in the incubator. 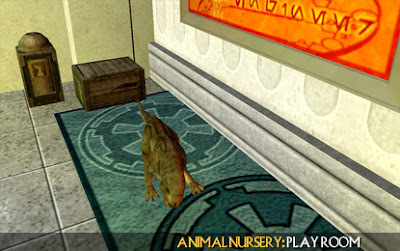 Inside, the nursery has all the necessary creature comforts, including food, colorful posters on the wall, a bookshelf with the full collection of "How To's" and pet owner manuals, stuffed toys (a dewback is pictured), as well as an "Oopsie Rug" - a woven piece of fabric with the Imperial emblem stitched in. The baby pets use this until they are completely housebroken. Adjoining the playroom is the lab proper. Rather small, it still contains all the required tools and equipment of the bio-engineering trade. Four large containers hold the raw enzymes and DNA, while two smaller chests (not pictured) afford scientists a place to keep the processed enzymes safe and at a regulated temperature until needed in an incubation cycle. The incubator is a marvel of modern science. Numerous starship engineers - some of the most brilliant minds in the galaxy - were tapped to design the schematics that are widely used to create the Incubator. From the controls in the front, a scientist can add the correct enzymes, alter the temperature and manipulate the egg in the center tube during the several-day process. 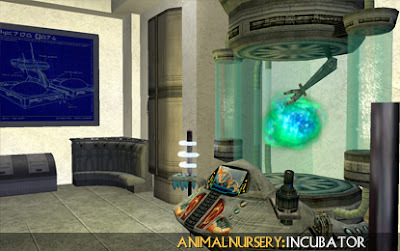 The incubator above shows a plains tusk cat nearing the final stages. All of the science in the galaxy means nothing without scientists to tend to it. At Oracle Base, Cyra Sedaris acts as the Chief Scientist, bringing her extensive bio-engineering skills with her. Here, we see Cyra manipulating the temperature gauge for a durni in it's last incubation cycle. I keep a safe distance back, lest I be a distraction. I hope you've enjoyed this edition of The Walking Tour. The collection system could breathe some new life into SWG. I'm interested to see what sort of things I can "collect". The idea adds instant content that every player can take advantage of. Some of the rewards have been effective teasers for the system. Not every day at Oracle Base is fun and leisurely, and today was one of those days. From the Tactical Center, the base received encrypted orders to have a team of specialists report to the hidden Rebel Base on Corellia and await further instructions from a protocol droid named C3PO. I enlisted the services of the Twi'lek entertainer, Cor'qi. Calling her an entertainer belies her true talents of graceful hand-to-hand combat. She is, in fact, in the service of an acquisition specialist by the name of Loh'khar, but what he did not know of Cor'qi's dealings today would certainly not hurt him. The trip to Corellia was faster then usual, with the Y-Wing "ugly" making good time. The Rebel Base is secluded in the mountains to the northwest of the main Corellian continent, reachable only via ground or hover vehicles. Cor'qi and I chose to travel together in one speeder, reasoning that while it is dangerous to be in one vehicle, it is far more dangerous for a team of two to be divided. The base was as I remembered it, having visited it numerous times in the past for missions. C3PO turned out to be a brilliant gold-plated protocol droid in the main chamber of the base; in fact, I recall working with him before. While he processed our main orders, which would take us to a far distant world, the Rebellion needed much closer, and far less glamorous tasks to be done. After delivering medical supplies to the perimeter outposts of the base, "Threepio" gave us our real mission parameters. As it turns out, a Rebel Spy had been captured by the Empire while operating out of Naboo. His whereabouts were not yet known, but it was paramount that we recover his contact list to avoid further implications. This mean an infiltration mission into an Imperial Base on Naboo. Perhaps a larger team would have been better, but we're Rebels - and we'll work with what we have. The Imperials had superior numbers and firepower, but after the first few "feeling out" salvos we sent at the base, our strategy was set. My training as a SpecForce Infiltrator was well-suited to pave the way for the both of us, straight past the defenses and to the storage chamber at the bottom where we found and extracted the spy's contact list. The problem now was, getting out. Imperial defenses finally spotted us on their sensors and a detachment of Stormtroopers swarmed the lower levels. We were pinned down and too deep to radio for any assistance, even if it was available. I don't know how things would have turned out without Cor'qi. She launched herself into the fray, allowing me a moment to throw down capsules of venomous gas, then a smoke grenade to cover my escape, clutching the spy's contact list close to the chest. Moments later, we burst forth from the base, back to ground level and into the grassy fields of Naboo. Our flash speeder had been camoflaged beyond a few hills, and with blaster bolts splitting trees and digging holes in the ground at our feet, we leapt in, triggered the accelerator and shot away to safety. Mission complete. The return trip to the Rebel Base was quiet, as Cor'qi and I were quite tired from the ordeal. Threepio accepted and logged the contact list into the computer and rewarded us each with a piece of some experimental body armor that Alliance scientists were working on. Great. Just what I need. More mad science. That certainly is an ugly suit of armor that the Imperials receive for completing their updated theme park. Imperials should always have the best looking, most functional equipment in the galaxy, while the Rebels should rely only on their good looks. With credits so easy to acquire and hard to lose, just what is it that compels players to charge astronomical prices for non-unique items? Really, what are they using the credits for if not to buy someone elses overpriced goods? It's a vicious circle. I'm not quite certain how the wanton slaughter of dozens of the galaxy's creatures will benefit the science of bio-engineering, but Cyra has given a task to do. We awoke that morning to the sounds of a violent sandstorm. Scruffy wasn't as shaken as I thought me might be. His species is one from a planet where there isn't enough sand to fill one of those archaic chronometers you'll find in the junk shops of Tatooine. While the little fellow hopped about the nursery, and "did his business" on that old Imperial rug I found in a trash compactor, I double checked my gear for the day. Enzyme extractors are syringe-like devices. If you think that isn't imposing enough, it is the weaponsmiths of the galaxy who have perfected their design; yes, the same crafters that are responsible for the DL-44 of BlasTech, and those Coynite Disruptor Rifles that fires globules of acid, no less. Science indeed, these extractors! Let us not forget to mention that the top models can run into the millions of credits! Too dangerous for Scruffy, I filled his food distributor, checked the mini-vaporator and gave him a pat on the head. Cyra was still asleep, so I gave her a loving peck on the cheek, and then had a read-through of the local terminals that tracks creature movements across the planet. Now do not think me a pacifist. (If I need to convince you further, I'll show you my own Coynite Disruptor Rifle. I've the matching pistol to complete the set.) It is just that I'll never understand why bio-engineering has not yet come up with a less invasive way to sample enzymes from animals. Must we kill the poor beasts in order to help them survive? Snorbals and Gurks were running high in population numbers. If their herds weren't culled, then they'd die of starvation or thirst. I'll keep telling myself this. They were easy enough to find, with my datapad able to triangulate their exact position as I neared. I'll spare you the gruesome details. Suffice it to say that my brief military training and superior firepower (compared to their having neither of either!) was enough to collect the required enzymes. I'm not so convinced that the money spent on those enzyme extractors were quite worth it. I've used inferior models and produced similar results. Someone is getting rich off of this for no good reason. 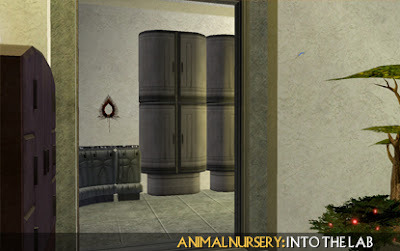 Before nightfall and any follow-up sandstorms, I returned to Oracle Base and stowed away the various enzymes in their proper cabinets in the back of the Nursery. That should hold Cyra for a day or so. Perhaps next time I'll provide you a walking tour of her Mad Scientist's Laboratory!